Having Preferred status on US Airways does not yield any real benefits. If you’re a USAir Silver or Gold Preferred customer, you’ll still get charged for picking an aisle or a window seat located in front of the plane – which USAir calls the “Choice Seats.” Not sure if Platinum or Chairman members have to deal with this issue as they are generally upgraded on every flight. Unlike United’s Economy Plus seats, USAir’s Choice Seats do not have extra leg room. Furthermore, you cannot purchase an exit row seat as a Choice Seat. Depending on when you purchase your ticket with USAir, you may be assigned to a middle seat. To get out of the middle seat, USAir will want to charge you US$20 to $40 extra for a Choice Seat depending on availability. Star Alliance Gold members also face the same problem (see my previous post), as status does not give preferential seating on US Airways. 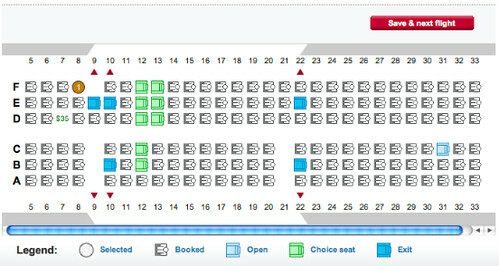 However, you may want to call USAir’s reservations line to request an exit row seat – it has worked for me in the past.